Hemp comes from the cannabis plant – the same plant that produces its more infamous relative, marijuana. In another article, we show how medical marijuana is defined as a cannabis plant with over .3% of tetrahydrocannabinol (THC). In fact, some marijuana strains are as much as 30% THC. THC is what gives the plant its psychoactive properties which result in the euphoric or “high” feeling. Hemp, on the other hand, has less than .3% of THC, but still contains many of the healing elements that the cannabis plant offers, such as cannabinoids, phytocannabinoids, terpenes, alkaloids and of course, the amazing B-Caryophyllene. A hemp plant has as many as 450 identified substances. When applied directly onto the skin, many of these substances have nutritious or medicinal properties without the “stoned” or high feeling. • Arthritis – Topical products are a good accompaniment to oral or ingested pain relievers. Topical hemp is particularly useful. In addition to the warming effect, it also contains CBDs and beta-caryophyllene. Beta caryophyllenes are found in many culinary herbs and have been found to reduce arthritis pain caused by inflammation. • Fibromyalgia – Many fibromyalgia sufferers have found relief from topical hemp products. Serum or root oil products are particularly soothing when applied to the known tender points of fibromyalgia. Research is ongoing to support these findings. • Joint pain from exertion or injury – Topical hemp oil is ideal for relieving the everyday aches and pains of muscle fatigue from exercise, sports or over exertion. • Multiple Sclerosis – There are encouraging findings supporting the belief that both orally ingested and topically used hemp provide relief from the symptoms of Multiple Sclerosis. • Migraines – Massage therapy is a traditional treatment for the pain and other symptoms of migraines. Products made with hemp root oil can be particularly useful in reducing inflammation and pain. In general, topical applications are considered a safe and effective way to relieve pain and inflammation. Topical applications are also a good accompaniment to natural, OTC, or prescription oral medications. Since topical treatments do not enter the bloodstream, side effects are not generally a concern. Specifically for hemp topicals, the very low occurrence of THC means there is no worry of an unwanted high feeling. Topical applications work at a cellular level. Once the C2 receptors of the nucleus cell penetrate, the DNA is signaled to produce a protein to turn off the production of arachidonic acid thereby reducing inflammation and pain. 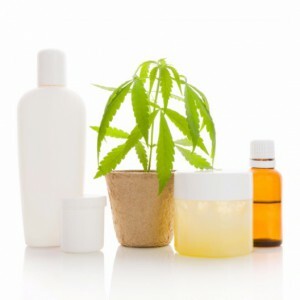 Topical hemp products, on of the many forms of medical cannabis, can be made into creams, lotions, massage oils, and serums. In most hemp products, the oil is processed from the root or the seed. Like any essential oil, pure hemp oil should not be used directly on the skin. Topical hemp products are typically mixed with other carrier oils or other beneficial ingredients. Hemp has been used topically for medicinal applications for over 6000 years. The use of root powder and oil were originally recorded in ancient China and subsequently spread to India, the Greek/Roman empire, throughout Europe and the rest of the world. Topical hemp products technically fall under the category of “industrial hemp.” Until recently, growing hemp was illegal at the federal level. However, President Obama signed the Farm Bill in 2014, opening the door for the growth of industrial hemp to promote research for its medicinal and ecological uses. Since then, over thirty states have introduced legislation to grow industrial hemp. Of these states, 28 have put laws in place to allow the cultivation of industrial hemp as long as the THC levels are .3% or lower. All of these states enforce stringent licensing and product control standards.